It can be a fine line between catchy and annoying sometimes. 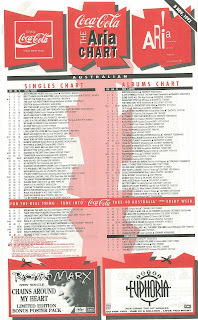 And this week in 1992, the highest new entry on the ARIA singles chart crossed that line by some margin. While the song gave the band responsible a huge hit, it also resulted in their fall from favour - something from which they'd never completely recover. A song that was also incredibly annoying continued to hold on to its position as the country's highest-selling single this week in 1992. "Achy Breaky Heart" by Billy Ray Cyrus spent its sixth week at number 1. As I mentioned when "Ain't Love The Strangest Thing" debuted, I feel like this would've been a much better launch single for the album of the same name. Instead, it ended up as a char also-ran. If this had been released three years earlier (and maybe not as the fourth single from an album), it probably would've been massive. The type of emotional ballad you used to expect from Richard Marx - although even more dramatic than "Hold On To The Nights" or "Right Here Waiting" - "Chains Around My Heart" felt like a backpedal for an artist who'd mixed things up with songs like "Keep Coming Back" and "Hazard". That said, I quite like it, but then I was no fan of Richard's new musical directions anyway. Speaking of new musical directions, middle-of-the-road balladeer Rick Price got his rock on (well, for him) with this third single from debut album Heaven Knows. With its wailing electric guitar and bluesy feel, it was quite a departure from "Not A Day Goes By" and the album's title track - and only crept up a few more places on the chart. Not only was "What's Wrong With That Girl" not a hit, but it also didn't spur Heaven Knows back up the chart. His album would get a second wind, but not until single number five was released. Music in the early '80s was great for a number of reasons. Rockabilly wasn't one of them. But acts like Shakin' Stevens, Rocky Burnette and The Stray Cats were certainly popular enough. This week in 1992, the genre least likely to make a comeback returned to the top 50 courtesy of Melbourne three-piece The Sharp, who gave rockabilly a '90s spin. Following an earlier independently issued EP, the band were signed to Warner Music and released their first major label EP, which featured the single "Talking Sly". As well as not sounding like anyone else on the chart at that point, The Sharp also boasted another unique selling point: their all-black, turtleneck-sporting look. Guess it beat Shakey-style double denim. It was greatest hits album time for Was (Not Was), who'd only ever had the one hit in Australia up until this point: 1987's "Walk The Dinosaur". The band formed by David and Don Was (not actually brothers nor their real names) had, however, been releasing music since 1980, including 1982's Born To Laugh At Tornadoes album, which featured the original version of "Shake Your Head". For retrospective release Hello Dad...I'm In Jail, the song was radically remixed by house producer Steve "Silk" Hurley, and new vocals were recorded by Ozzy Osbourne (who'd performed on the original) and, somewhat unexpectedly, Kim Basinger. Kim was recruited only after Madonna turned down the band's request to use her vocals (recorded when she auditioned to sing on the original version) for the remix. From a band just slipping in to the top 50 with their second hit we move to a duo who are a bona fide one-hit wonder. Charles Pettigrew and Eddie Chacon hit big with debut single "Would I Lie To You? ", an irresistible slice of retro soul that completely overshadowed anything else the pair ever released. A relatively modest number 13 hit in their homeland of the US, "Would I Lie To You?" topped the UK chart, and was a top 3 success across Europe and in Australia, where it held its peak position for four straight weeks. Charles and Eddie continued working together until the former's death from cancer in 2001. More recently, Eddie has been a member of another duo, electronic act The Polyamorous Affair. Number 25 "Accidently Kelly Street" by Frente! 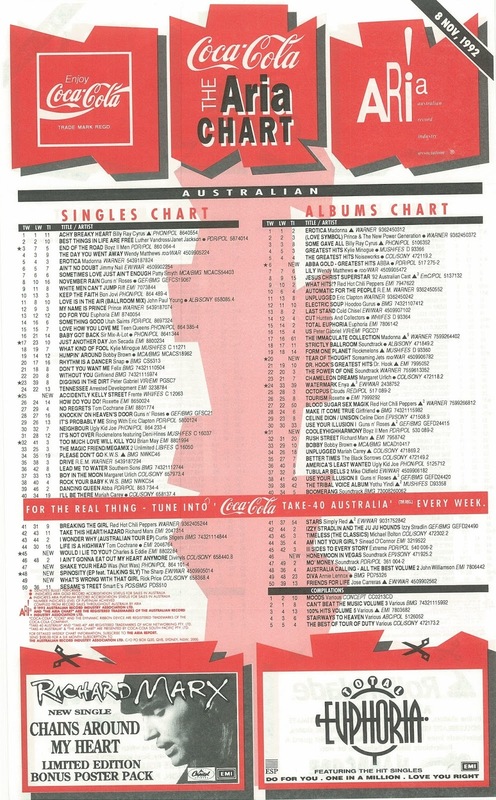 Holding its peak position for five weeks was a song that would quickly earn its place as one of the most irritating non-comedy releases in Australian music history. The follow-up to Frente! 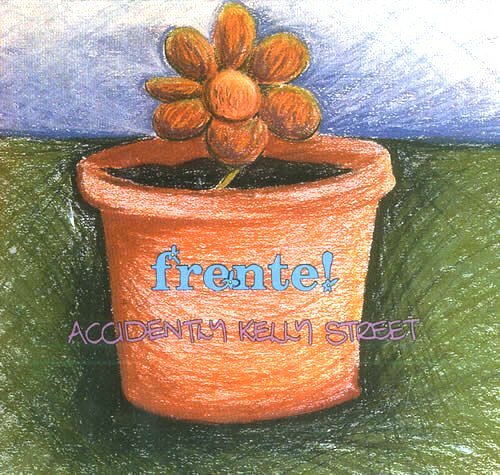 's breakthrough Clunk EP, "Accidently Kelly Street" sounded like a Play School nursery rhyme - a comparison that was compounded by the cutesy music video. And while I'm the first to admit I like plenty of cheery, optimistic songs, this was even too saccharine for me. Just as irritating was the fact that the song's title was misspelt (or misspelled, if you prefer). Although, I guess if you are going to unintentionally spell a word incorrectly, it may as well be "accidentally". Of course, Australia being Australia, the massive success of a song like "Accidently Kelly Street" resulted in the inevitable piss-taking, notably by The Late Show, who sent it up as (a correctly spelt) "Accidentally Was Released" in the season one finale in late December. I'd suggest their parody contributed to the song's (and album's) rapid descent out of the top 50 in early 1993 and was the reason Frente! made a much more subdued second video for the song. But the damage had been done and despite going home with a couple of ARIA Awards in April 1993 (one for "Ordinary Angels", the other for Marvin The Album), the band found themselves on the receiving end of a massive backlash. We'll see what that meant for them on the singles chart next year. Next week: three previously successful Australian rock bands falter in the 40s, while three quite distinct dance tracks become massive summer hits. I didn't really get the Frente backlash. I mean, did people expect Angie Hart to be Christina Amphlett? Or Suze DeMarchi? Or Olivia Newton John? I guess in 1992 there wasn't room for an Aussie band that didn't trade in in-yer-face shouty pub-rock. "Accidentally [I can't intentionally misspell it because of this stupid auto correct] Kelly Street" was a bit twee, and probably deserved to be parodied, but hey – I still like it. I agree with Pete. The Frente! backlash quite surprises me (I was unaware of it until now but a quick google search confirms that there is real hate for this band and particularly this song).This song doesn't actually annoy me much at all. It's twee, but it's supposed to be, and while far from a favourite, didn't bother me in 1992 or now. I didn't know Madonna had submitted a demo vocal for Was (Not Was), good fact. Another great week in music. Total Euphoria dropped to #15 on the album chart in its second week. Erotica however, stayed strong at number 1! I wish I could relive 1992 all over again but now that I'm older and can fully appreciate the great music of my youth.